Honeyeaters belong to the Australo-Papuan lineage of passerines. Their nearest relatives are probably fairy wrens (Maluridae) and Australian warblers (Acanthizidae). The sug-arbirds (Promerops) of South Africa have been classified as honeyeaters but are probably starlings. 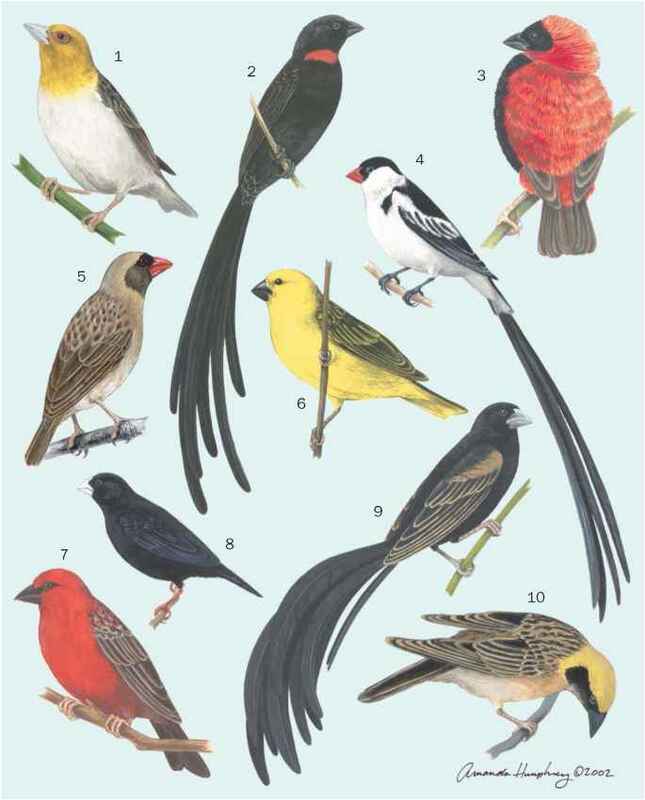 The dwarf and longbill honeyeaters of New Guinea have been shown by molecular analysis to be more closely related to flowerpeckers (Dicaeidae) than to honeyeaters, whereas the Bonin Island honeyeater (Apalopteron familiare) is a white-eye (Zosteropi-dae). However, MacGregor's bird of paradise (Macgregoria pulchra) appears to be a honeyeater on the basis of mito-chondrial DNA. Relationships within the honeyeaters have not yet been fully unraveled. A few genera, such as Myzomela, Meliphaga, and Lichenostomus, contain numerous very similar species, whereas others are artificial and contain unrelated species. Honeyeaters of New Zealand and Hawaii do not have obvious close relatives in Australia or New Guinea, and perhaps some are not honeyeaters. Most genera with more than one or two species are centered in Australia. However, Lichmera and Philemon have many species in Wallacea (Moluccas and Lesser Sundas). Myzomela is the most widespread genus, occurring from Australia to Sulawesi, Micronesia, and Fiji.